Learn more about the international business degree program at Rollins College. Rollins’ international business program was recently ranked No. 9 out of 143 programs in the U.S. and No. 1 in Florida by College Factual, a leading source of college data analytics and insights. As the business world becomes increasingly international and interconnected, successful leaders need more than a traditional business degree to stay competitive. At Rollins, our AACSB-accredited international business program blends the breadth of a top-ranked liberal arts education with the depth of an elite business education, giving our graduates a competitive edge in the job market. 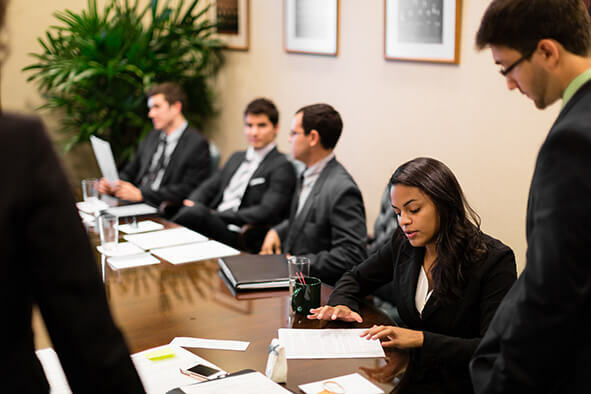 As an international business major at Rollins, you’ll build a well-rounded base of knowledge, experience, and skills as you prepare for an array of careers in everything from accounting and finance to marketing and operations. Through study abroad experiences and international internships, you’ll hone in-demand communication and analytical skills and develop the ability to navigate foreign cultures and languages—credentials that are essential to success in today’s global business environment. Elite Accreditation Our international business program is accredited by the Association to Advance Collegiate Schools of Business (AACSB)—the highest standard of achievement for business schools worldwide. Top Ranked Our program is consistently ranked among the country’s top 5 percent of international business programs and No. 1 in Florida by College Factual. Global Focus All courses utilize an international lens. IB majors study abroad, intern internationally, and become fluent in a second language. In addition to an international business internship and study abroad course, majors complete eight core international business courses, two international business electives, and two foreign language courses. Majors also have the opportunity to do concentrations in the areas of family business and entrepreneurship, finance, and marketing. INB 200 Introduction to International Business Introduces basic concepts and examines key forces impacting international business. Examines global, political, economic, cultural, legal, demographic, geographic, and historical processes to understand how the world economy functions. Discusses international institutions, country market evaluations, foreign direct investment, the multinational company and its functions (organizational behavior, finance, marketing, operations), as well as the ethical environment of global business. INB 337 International Marketing Management Examines strategic marketing and market entry decisions in the context of dynamic global, regional, and country market forces. Emphasizes how international marketers standardize and adapt product/service, pricing, channel, and communication strategies to meet target market needs and company objectives. Students will develop a comprehensive international marketing plan for a specified product or service. access to business-related field studies and semester-long study abroad programs across the globe. Immersive Internships Supporting Fair Trade organizations in Madrid. Marketing state-of-the-art health-care systems in Munich. Providing operational support in China. You’ll develop in-demand skills and experience through international internships. Get Involved From the Collegiate Entrepreneur’s Organization (CEO) to Net Impact, you’ll sharpen your business acumen through a number of student-run organizations and honor societies. Rollins international business grads are making tomorrow happen at some of the world’s top companies and most prestigious universities. When he’s at work, Airbnb’s Global Portfolio Manager Pierce Neinken ’06 ’08MBA pretty much has the world at his fingertips. Kamil Fadel ’17 is a high-flying international business major with plans to impact the world through social entrepreneurship and finance. 8 core international business courses focusing on international accounting, economics, statistics, marketing, operations management, management information systems, finance, and global strategy. 2 foreign language courses which can include Chinese, French, German, Russian, and Spanish. 2 international business electives which can include global sports business, global entertainment business, international advertising, international real estate, and global franchising. Participate in a Rollins international internship program. Find your own summer internship abroad. Find a local internship with and a complete reflection paper on some aspect of international business. Participate in a Rollins semester abroad program. Participate in an approved study abroad course. Be an international student studying in the U.S.